Dr. Chuck Yan's involvement in metrology began in 1990 when he was a PhD student at the NSF supported Coordinate Metrology Research Center of The Ohio State University. Working with Prof. Menq, Dr. Yan developed various mathematical algorithms to improve the accuracy and efficiency of feature evaluation and conducted in-depth study on measurement uncertainty in coordinate metrology. Based on his PhD work, a number of academic research papers were published. To promote his research work in real-world industrial applications, Dr. Yan co-founded Integrated Quality(IQ) in 1994 and served as COO and principle software developer until IQ was acquired by Nikon Metrology in 2008. Over the years IQ worked with many industry leaders such as Starrett, Sheffield, SMX, RAM Optical and API to provide software solutions for their products. At Quality Expo 2003 in Chicago, IQ launched its flag-ship CMM-Manager software and developed direct plug-and-play interfaces for most of the CMMs on the market. 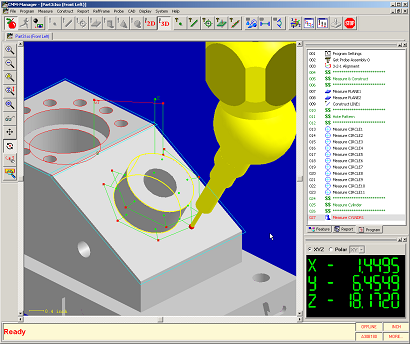 To date, over four thousand CMMs have been retrofitted with CMM-Manager software. In January of 2011, Dr. Yan founded Insight Metrology to provide better service to customers and better support for distributors while working closely with Nikon Metrology to promote CMM-Manager software. Today, Insight Metrology is focused on providing hardware interface solutions for retrofitting used CMMs with CMM-Manager software.